There needs to be a bigger word than triumph to describe the Aspen Music Festival’s accomplishment with Peter Grimes. Benjamin Britten’s operatic masterpiece took over the 2,050-seat Benedict Music Tent Saturday night and held its audience spellbound for nearly three hours, musically, dramatically and emotionally. Occupying half the stage, the Aspen Festival Orchestra (principals from major orchestras, fleshed out with students) grabbed this emotional roller-coaster of a score and ran with it. This affords an advantage over the opera house, where the orchestra would be hidden in a pit. Britten’s music, sometimes resplendently ripe, at other moments reflecting music-hall vernacular, or when the situation called for it crushingly dissonant, became a visible character in the drama. Festival music director Robert Spano’s passion and clarity were on display as he conducted it all. Fishing nets hanging from the ceiling, a few wharf posts along the front of the stage and a scattering of crates and barrels suggested enough of the Borough’s fishing village setting. Old-fashioned clothing set the tone. 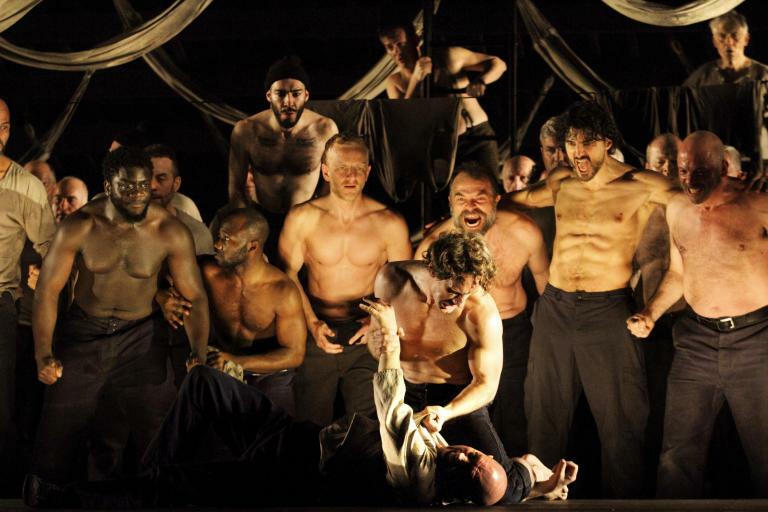 But Edward Berkeley’s staging took advantage of the tent’s space in other ways, such as deploying the chorus outside the tent and then around its inner periphery for a riveting final effect. Grimes is an outcast, a demonized fisherman whose apprentices keep dying in suspicious circumstances. The opera paints detailed pictures of him and the society he can’t fit into, setting in motion tragic events. In a good production it’s as gripping as a four-star movie thriller. This one did all that, and went one better, with a cast as strong dramatically as it was vocally. Tenor Anthony Dean Griffey in the title role sang his notoriously difficult music with purity and a kind of sincerity that made Grimes, desperate for a chance to prove his worth, a thoroughly believable split personality, at once blissfully ignorant of the social stigma he suffers and brutally resentful of the pain it causes him. He was transfixing in his big moments, such as the Act I aria “The Great Bear and Pleiades” that introduces his psyche and his Act III final scene, a classic operatic mad scene in which snatches of music come back to haunt him. There was no crooning, no musical cheating, just a flow of magnificently nuanced sound. In the other leading roles bona fide stars delivered the music with precision, creating flesh-and-blood characters with vocal shading and stage presence. As Ellen Orford, the widowed schoolteacher Grimes longs to marry, Susanna Phillips unleashed a creamy soprano that responded to each situation with heart-tugging phrasing. Her Act III “Embroidery aria” was a thing of poignant beauty, set up by her guileless willingness to be helpful in the previous two acts. Baritone Brian Mulligan, a product of Aspen’s summer opera program now performing leading roles around the world, invested Balstrode, the veteran captain who refuses to join the mob vilifying Grimes, with gravitas and a richness of voice one seldom hears in this role. (It’s often played by older singers.) He provided a center of gravity to balance the borough. Meredith Arwady, another experienced pro, lent her resonant contralto and an earth-mother presence to Auntie, the publican who caters to the town’s baser needs and resolutely remains neutral. Student singers rose to the occasion repeatedly in smaller roles. There were several standouts in a strong cast. Mezzo-soprano Charis Peden (Old Woman in the recent “Candide”) invested Mrs. Sedley, the town gossip and laudanum addict, with the low notes to make her extra-sinister. Baritone Kelly Markgraf made a dashing Ned Keene, the apothecary who provides Mrs. Sedley’s pharmaceuticals and Grimes’ latest apprentice. Baritone David Salisbury Fry made a stolid Hobson, the slow-witted cart driver and town constable. Soprano April Martin and mezzo Oriana Dunlop were a fetching pair of Nieces in Auntie’s fold. Their Act II quartet with Ellen, consoling each other as the men go off after Grimes, was a waft of unexpected warmth. The 100-voice Colorado Symphony Orchestra Chorus proved the icing on the cake. Creating a living, breathing, wrenching mountain of sound, its evocative timbres colored almost every scene and gave voice to the prejudices and thoughts of the borough’s denizens with stunning clarity. Every word came through. With all this going for it, Spano’s impeccable pacing allowed tensions to build, release, and rebuild into towering climaxes, or refine into delicate moments. The eerie music at the end of Act II, as the mob investigates Grimes’ deserted hut, could not have been spookier. The famous Sea Interludes, which separate the scenes, wrote eloquent musical chapters. Britten’s music of the sea surged and ebbed, seeping into every scene. The whole was even more impressive than the parts. Voices painted personalities that brushed against each other, clashed, bonded and otherwise created a vivid patchwork of society. This was opera with a capital O, immediately communicative, at the same time plumbing unexpected depths, an unforgettable experience.